Stories of learning, teaching, and turning points, in the Experience series. Edward O. Wilson, the Pellegrino University Professor Emeritus, was born in Alabama in June 1929. 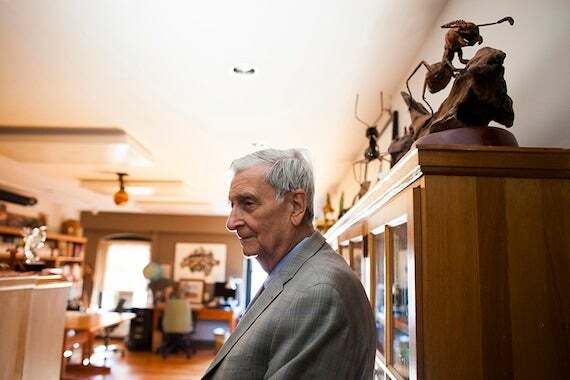 A boyhood immersed in nature and the world of insects provided an education he would build on through high school and at the University of Alabama, and then during graduate studies at Harvard, where he’s been since receiving his Ph.D. in 1955. Wilson is probably best known for his groundbreaking insights on ants, but his research has extended deep into other realms of science, sometimes with provocative results. His theory of island biogeography, written with Robert MacArthur, examined how species rise and fall on isolated islands, both those surrounded by water and, more importantly for conservation today, habitat islands surrounded by different landscapes. His book on the biological roots of behavior, “Sociobiology,” touched off an academic row in the mid-1970s. Wilson’s honors include two Pulitzer Prizes — for “On Human Nature” and, with Burt Hölldobler, “The Ants” — the National Medal of Science, in 1976, and the 1990 Crafoord Prize from the Royal Swedish Academy of Sciences. He retired from full-time scholarship and teaching in 1996, but has carried on with research and writing. Q: What guided you into the field of ant biology, and were there other options at the time? A: There weren’t many options growing up in Alabama and I wasn’t even thinking that I would eventually have to choose a career. But I had chosen one just the same. I had become so passionate about nature and insects that I decided by my teens that I would become an entomologist. I thought probably what I’d do is join the Department of Agriculture and become an extension entomologist and advise farmers. Basically, I was willing to do anything to allow me to devote myself to entomology. I also got a lot from the Boy Scouts. That’s where I got my main education in an otherwise poor public school system. When I arrived at the University of Alabama, I had just passed my 17th birthday. I found that the doors were open and the faculty there was very welcoming and supportive. They didn’t get many people, back there in the ’40s, who were interested in becoming an academic. Most of the biology concentrators were pre-med. I graduated shortly after my 20th birthday, then went on to get a master’s degree, and then to the University of Tennessee — that was getting pretty far north for me — to join their doctoral program. I had a wonderful professor of botany named Jack Sharp. He was known nationally for his research on plants. In late 1950 or early 1951, he wrote from Knoxville to his friend Frank Carpenter, who was chairman of the Biology Department and professor of entomology, and said, “This kid does not belong here, he belongs at Harvard.” He did me a tremendous service with that letter. I’d already visited Harvard in the summer of 1950, mainly to see the ant collection and visit a graduate student working on ants with whom I’d corresponded. I had made some added connection there and met one of the professors in the Biology Department. The result was that Harvard wrote me, saying that if I cared to apply, it’s very likely I would get a teaching fellowship and be admitted. And I did just that. In the spring of ’53 I was overjoyed to receive a junior fellowship [of the Society of Fellows], and the ability to go anywhere in the world I wanted, with all expenses paid, to do anything I wished. The only oath asked of the new junior fellows at the dinner at Eliot House was that they do something extraordinary. What an incredible charge to give an ambitious young man or woman: “We don’t care what you do, what field you go into as long as you accomplish something — as a junior fellow — extraordinary.” I decided I would do that. Q: What was it about entomology that attracted you? Was it the ability to explore the outdoors or something about the insects themselves that drew you? A: I have only one functional eye, my left eye, but it’s very sharp. And I somehow focused on little things. I noticed butterflies and ants more than other kids did, and took an interest in them automatically. Even at the age of 9 in school in Washington, D.C., I was reading about insects through all the National Geographics. And there was one article in 1934 entitled, “Stalking Ants: Savage and Civilized.” It happened to be by the man [William M. Mann] who later became the director of the National Zoo, and he got his Ph.D. here at Harvard. It just knocked me flat when I read about that. Even though most of the species he depicted were found only in other countries, especially in the tropics, I was soon out watching ants, trying to find the ants he mentioned in the book and going to the national museum. I was also developing a passion for butterflies. I had a net, which my stepmother made for me from a coat hanger, cheesecloth, and a broom handle. So I was off and running by the age of 10. I was trying to read books on entomology. They were over my head, of course, but I had the ambition to learn what I could when I could. And all through my teen years, as I was advancing up to Eagle Scout in Alabama, I was focusing on natural history, including ants and butterflies and snakes. A: Ants are easy. I had been collecting them all over the state of Alabama and elsewhere and identifying [them]. I had already, in high school, made friends with the very small number of ant experts in the United States, exchanging specimens and getting advice and so on. It seemed terribly easy to me from the beginning. What I wanted to do when I got to Harvard was get a much broader background. This was helped substantially by contacts in the Biology Department and also the Society of Fellows. I had the pleasure of having conversations with other junior fellows, who included people like Marvin Minsky and Noam Chomsky, and got to meet people like T.S. Eliot and Robert Oppenheimer. It was just amazing. You could talk with these exceptional people and grow in breadth and confidence. But the dream that kept returning was to go to the tropics and study the ants of the rainforest. I left almost as soon as I became a junior fellow. In 1953, I was off to Cuba and Mexico, a paradise for me of tropical forests inhabited by hundreds of kinds of ants. And then I came back and finished my Ph.D. I soon informed the chairman of the fellows, the historian Crane Brinton, that I was on my way to New Guinea, to all the other archipelagos of Melanesia, and I would try to cost the Society of Fellows as little as possible. And off I went. It was there that I collected ants and studied rainforests and thought about ecology and took long, sometimes solitary trips through the forests. I began to develop ideas about how ants had gotten into these distant places and how they’d evolved. In later years I realized that what I was doing is what Germans call wanderjahr, the year of wandering. It is a German expression for young men who were expected to leave the village. They’d mature and go off to another village to learn a trade. And this is what people like Darwin, Philip Darlington, here the curator of entomology, and Ernst Mayr had done. As young men, they were in the tropics soaking up all the raw information and experience of what the natural world is really like, and forming ideas about it. I came back in 1955, married, and was bursting with ideas about what I could do in science, using ants as my principal group. Q: And did that trip lead specifically to any of your noted theories? Did the theory of island biogeography come from there? A: That came straight from there. When I met Robert MacArthur in the late ’50s, we were both young professors, deeply worried about the status of our field, which was ecology and evolution. It was a golden age of biology, but of molecular and cell biology. It looked as though ecology, systematics, and biogeography would just be relegated to third-line status as far as universities like Harvard were concerned. MacArthur and I hit it off very quickly. He had mathematical modeling ability and I was already publishing substantial papers on Asian and Pacific ants. We put our heads together and … developed the theory of island biogeography. It was immediately successful, because it hooked up ecology to conservation biology. The world consists of islands, the reserves and the parks and the remnant patches of forest on the mountainside are islands. We saw the [theory as a] way to deal with the fate of species that were essentially confined to what we call habitat islands. Q: As forests have become more fragmented and habitats have become smaller, has the theory become more relevant? A: Oh, vastly more relevant. It’s one of the foundation pieces of conservation biology: how to understand why there are a certain number of species in a forest, maybe a forest on an island or maybe a fragment of forest on the continental coast. How to analyze it, find out what’s happening, to look into particulars like how often species reach the island, how fast they’re likely to be going extinct, how fast they might be evolving to create new species. All those factors are seen as basic in evaluating the status and the value of a particular reserve. Q: Clearly you’ve made several seminal contributions to science — is there one that you feel proudest about or view as your crowning achievement? A: By 50 years from now they’ll say, “Look, here’s the Museum of Comparative Zoology, where that fellow … what was his name?” [Laughs] I’ve had several “aha!” moments. Certainly one was the theory of island biogeography that came together in conversations with MacArthur. Third happy — aha! — moment. The one time I couldn’t sleep at night was after making the first fire ant pheromone discovery. I did it here in the lab with fire ants. I decided to use a trail pheromone. When I hit the tiny gland that produces it in the rear part of the ant, I got a completely surprising response. The ants followed it, but it activated them in a variety of other ways. It excited them. It caused them to start communicating with other ants that followed. The fire ant trail substance was the first glandular pheromone source discovered in insects, or at least in social insects. Subsequent research showed that it was a blend of pheromones. So what I was looking at was a variety of messages sent simultaneously among the ants. One aha! moment, sort of a lowercase aha!, was the discovery and description of the first ant of Mesozoic age, in other words, ancestral to modern ants. I knew that ants must have originated in the age of reptiles, back in the Mesozoic, but the earliest specimens we had were from the age of mammals, back 60 million years. So all of us were waiting for the discovery of a Mesozoic ant, when two of them were found in one piece of amber. I’d like to tell you it was found on an upper branch of the Amazon River, but it wasn’t; it was on the New Jersey shore [laughs] — in a 90-million-year-old deposit of amber and woody materials. Out of that came a perfect specimen in a perfect piece of amber, clear as glass with two ants in it. That was a thrilling moment to put it under a microscope and say, “OK, guys, we’ve already made it to 60 million and now we’re going to go all the way back to 90 million.” And the darn things fitted exactly how we predicted if ants evolved from wasps. A: That was the late ’60s. Sociobiology was far more than what many of its critics wanted to call it: just the belief that human beings have genetic-based instincts. Sociobiology is the systematic study of the biological basis of social behavior in all kinds of animals, and that’s how I developed it in those two books. It was very simple. I did say that maybe the same principles that we’re learning from comparative studies of social behavior and the evolution of social behavior in animals might apply to human beings. But if it applied to human beings, the only way it can be applied meaningfully is that human beings have instincts. We have drives that are inborn, that people inherit, and there may be variation among people. I stepped into a minefield by finishing this big book, “Sociobiology,” with a chapter saying how it could be applied to people. I tried to be cautious. I should have been more politically careful, by saying this does not imply racism, it does not imply sexism, I’m not trying to defend capitalism, so don’t drop the world on top of me. If I’d added that in the book, then I might have gotten off a little easier. In the ’60s and ’70s it became almost dogma — it was a dogma — to believe that the human brain was a tabula rasa, a blank slate. I don’t think scholars in this generation, even those of middle age, can appreciate how stern was the prohibition against believing that human behavior was influenced by genes in any manner whatsoever. The only acceptable view was that the brain was a blank slate and what humanity does and humanity feels and what societies end up becoming is strictly a matter of choice and is determined by our history, particularly by the culture we’re born with. We can design a much more perfect society if we use our reason and train the brain accordingly. That was the belief in the social sciences. It was also the belief of the — how shall I put it — the far left among some scientists, including two of my more notable colleagues here at Harvard, Richard Lewontin and Stephen J. Gould. They were really incensed that a colleague of theirs would deviate so far from what was the needed ideology, the political ideology, to make social progress. And they were marvelously sophisticated Marxists, with well-reasoned ideas of how to blend socialism and biology. Harvard faculty and the students — partly as a result of the convulsions of the ’60s — were far left and very few would openly defy them. Being from Alabama, I was expected, I think, to be a conservative. And I can tell you now, thinking back, I was really neither. I was at neither end of the spectrum. I was an innocent sociobiologist. I thought that this was a great idea. I saw all sorts of possibilities for building a sociobiology that could then be picked up by social scientists. And I really was so naive as to think my colleagues in the social sciences would be grateful to me [laughs] for having provided them with a whole different armamentarium for their theories on the origins of human behavior. What I got was mostly buckshot [laughs]. That has changed now, but that was the aha! moment. Q: Were you surprised at the response? Did you have no idea it would be controversial? A: I had no idea. I really wish I could say I knew it was coming, but it really blindsided me. And it took me a while to figure out how to respond. Q: Did you have an emotional reaction? Did you feel hurt or was it more intellectual? A: It was more intellectual. The first time I saw one of these counterattacks appear in The New York Review of Books, I saw I was going to win this one. With the reasoning and evidence, I felt confident. It was science versus political ideology. But I really was upset at being called a racist, promoting racism and sexism. I was accused of trying to reintroduce a retrograde, outmoded, dangerous philosophy. There was nothing in “Sociobiology” to suggest such a thing. The words had to be taken out of context and tweaked. On one occasion, I had a little mob in Harvard Square parading and protesting and holding placards demanding that Harvard dismiss me. On another occasion, when I was to give a lecture at the Science Center, a crowd of protesters gathered at the entrance with signs and shouts and chants and so on. I was ushered in through the rear by University police. My class was disrupted at least once. Not seriously, but yeah, that’s annoying. Looking back at that now, it was a very strange period. This created a sensation, but at least students were exposed to new ideas. I say to myself to this day, “Is this not what a university is for?” This is what a university is supposed to be doing. Wilson, in his office at the Museum of Comparative Zoology, writes or does research daily. Q: How about mistakes along the way? Are there things that you regret or things you might have done differently? A: That was one of them. When I was writing “Sociobiology,” if I had to do it over again, I would have written a solid piece in that infamous final chapter and said that it really tells us nothing about the best political system or correct ideology. This is just knowledge, through which we can acquire a view of the human condition. We can acquire what we did not have before and this has to be useful. Q: What is the strongest argument today that your thoughts on sociobiology were right? I hear a lot of things related to the obesity epidemic, people trying to explain why we behave the way we do. A: That book came out in ’75, and in the early ’80s, the field of evolutionary psychology spun off. My colleagues working in the social sciences and psychology who created evolutionary psychology avoided the word “sociobiology” — some of them told me this. They wanted to use another word that wouldn’t be tarnished from the beginning. To this day “sociobiology” is only sparingly used as an expression because people are still a little afraid of it. In 1978, in the midst of all the tumult — people smile when I say “tumult” in talking about academics hitting one another with beanbags; it really wasn’t quite the same as a civil war — I said to myself, “I have to write a book that will do what I should have done in ‘Sociobiology.’” That is, explain how I view human behavior and what the applications of sociobiology could be and what the possibilities of it are. Q: What do you think of an entomologist winning two Pulitzer Prizes? Is that something you could have envisioned when you were a young boy? A: I think it’s bizarre [laughs]. It was luck. The second Pulitzer was a big, comprehensive book Bert Hölldobler and I put together. Bert and I worked together for a dozen years in the laboratory section of the MCZ [Museum of Comparative Zoology] and our collaboration was very fruitful. We had different talents and different approaches. Bert brought in rigorous methods of investigation by stepwise experimentation. I brought into the mix the scientific natural history. I knew the ants; I knew what was interesting to look at. We published a lot. And then Bert couldn’t get enough of the support he needed and the University of Würzburg offered him a million dollar prize to create anything he wanted to create. And so off Bert went. But before he left, we said, “Look, between the two of us, we know everything there is to know about ants.” Nobody could say that today because the field, myrmecology, has grown exponentially, but you could say it then. And we said, “Let’s write a book that has everything known about ants.” And to my astonishment, it was given the Pulitzer. It was also the only book of science-meant-for-scientists to win the prize. We didn’t write this for the literary world — we wrote it for scientists. But we did our best job of writing and illustrating and so on. Q: What is your philosophy of writing? Do you have writing habits? Do you write every day? Q: Do you love it or is it a chore sometimes? A: I love it. You know, like a shark, unless you swim you sink? I have that feeling. I remember one of the great pianists once said about practicing, “I miss a week of practice and the audience notices. I miss a day, and I notice.” It’s just what I love to do. I love the research, I love the study, I love the quiet thought, and I like writing. I just write or conduct research every day. Always there’s something new to write about. Q: Do you do it here or do you have a study at home? A: Mostly, I do it at home now. And I write longhand on yellow, lined legal paper and Kathy Horton is the reason I can do that. She’s been working with me 47 years and she knows everything, knows everybody. Q: Safe to say she’s deciphered your handwriting by now? A: She has. There have actually been occasions where I couldn’t decipher what I’d written, at least a word or two, but she could translate it. She’s like having a cuneiform expert help you out with Assyrian tablets. She is really very good at what she does and it has allowed me to move smoothly over a long period of time. Q: What is most exciting about your field right now? A: I haven’t changed since I was a 17-year-old entering the University of Alabama. I’m still basically a boy who’s excited by what’s going on. We are on a little-known planet. We have knowledge of two million species, but for the vast majority we know only the name and a little bit of the anatomy. We don’t know anything at all about their biology. There is conservatively at least eight million species in all, and it’s probably much more than that because of the bacteria and archaea and microorganisms we’re just beginning to explore. The number of species remaining to be discovered could easily go into the tens of millions. We will in time see a surging interest in and support of the area of biodiversity studies. I believe Harvard should be the world’s leading university in this field and in those branches of ecology and conservation biology that have biodiversity studies as a foundation. Harvard should be in a position to lead, because Harvard has the largest private collection of plants, animals, and fungi — three of the major groups — in the world. It has one of the finest libraries in the world. It has a great tradition, going back to Agassiz, of major studies and acquisitions of major collections. It’s obvious that this is the place to build the discipline … so that Harvard could be one of the universities, one of the rare universities, in the front rank of both of the two big divisions of biology, structure and history. Q: How do you feel about the future of biodiversity on the planet? Are you optimistic or pessimistic? A: I use an expression John Kennedy used at least once about the future generally: cautiously optimistic. I’m now advising on reconstruction of a national park in Mozambique, the Gorongosa National Park. I’m working with a group on the Gulf Coast to create a new park at Mobile and the Delta, which will be the biologically richest in America. This is how I’d like to see progress achieved, step by step. It’s what I’m going to be involved in, as much as I’m able, in the years I have left. We have an opportunity. We still can put aside a large portion of the world in reserves of biodiversity. But that potential is shrinking steadily and we really need to do something now. This is where Harvard can play a major role. If it becomes policy in a sufficient number of nations, then there are plenty of reasons for optimism. But if we keep going the way we are now, we’re going to lose a large part of biodiversity by the end of the century. Q: What lessons can a young student starting out today, looking at your career and thinking, “I want to make an impact like that” — what lessons can he or she extract from your life? A: It almost sounds trite, you hear it so often, but you don’t see enough of it in college-age students, and that is to acquire a passion. You probably already have one, but if you haven’t got one, search until you find a passion and go all out to excel in its expression. With reference to biology and science, do the opposite of the military dictum and march away from the sound of guns. Don’t get too enamored by what’s happening right at this moment and science heroes doing great things currently. Learn from them, but think further down the line: Move to an area where you can be a pioneer. That kind of opportunity is everywhere in science and especially in biology, including biodiversity studies and ecology. Q: Did you ever think of leaving Harvard? You’ve been here many years and had lots of victories. What kept you here all the time? A: I like being at the world’s greatest university with the world’s best insect and ant collections. Believe it or not, however, during the height of the anti-sociobiology furor, I started looking around at other universities where I could work in peace. I have to confess, here for the first time, I had a fantasy of going to Texas A&M, where I could sit peacefully in my lab working, with good graduate students, while watching cadets marching by outside [laughs]. But I never really came close to leaving Harvard. It’s just too great a place. Interview was edited for clarity and length.